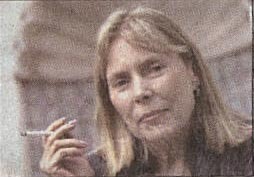 Writer Cathryn Michon recently met Joni Mitchell, who, she says, has always been like a mother to her. Michon, who recently published a humorous, mock self-help book, told us she had a "long, gorgeous lunch," with Joni Mitchell after writing about the singer. They were brought together by a friend of a friend. "I understand from People magazine that a girl has come forward who claims to be Joni's daughter , but let's look at the cold facts. This 'daughter' does not sing at all, whereas I, like Joni, am a three-octave soprano. This 'daughter' looks nothing like Joni, whereas I cannot set foot in a room where there are musicians without someone going on and on about how much I look like Joni." Michon, a former TV writer, actress and stand-up comic now says it was all a joke, and that Mitchell didn't seem to mind. As Michon writes in her book, "All I want is to play Joni in the miniseries of her Grrl genius life that so desperately needs to be made." This article has been viewed 1,687 times since being added on July 16, 2001.